Seventeen well-recognized lecturers will arrive this summer to Santiago de Compostela (Spain). The event will be held from 17 to 21 July. CiTIUS organizes the III SFLA (European Summer School on Fuzzy Logic and Applications), an event promoted by the European Society for Fuzzy Logic and Technology and addressed to PhD students and young researchers from both academy and industry. With the aim of introducing the core aspects and recent developments of Fuzzy Logic and related applications, several courses will be delivered from 17 to 21 July by renowned global scientists, world-leading experts in the field. A key aspect of the School will be the communication and collaboration among the participants and the lecturers, by giving time for discussions to the aim of generating a fruitful ground for exchanging knowledge. We will invite the students and young researchers attending the school to give short presentations on their activities. Moreover, all of them are encouraged to take part in the "Your Thesis in a Dram" (YTD) Contest. Early Registration Fee: 350 €. Late Registration Fee: 450 €. Accommodation (5 nights: Jul 16-20). Full board (5 days: dinner, Jul 16 - lunch, Jul 20). 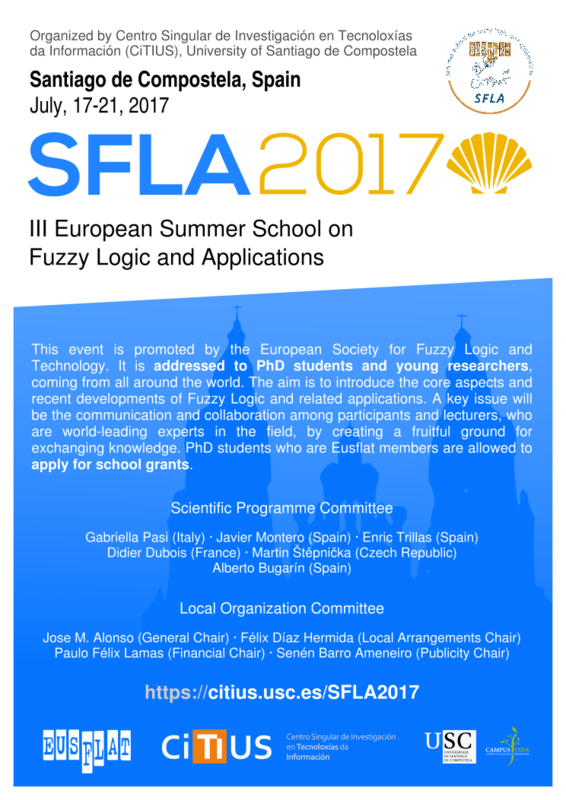 The European Society for Fuzzy Logic and Applications offers 9 grants to promote EUSFLAT student members to take part in the summer school. Accordingly, EUSFLAT student members are encouraged to apply for these EUSFLAT grants which cover 300 euros of the registration fee. So, grant holders will only pay a symbolic fee of 50 euros by the early registration deadline (May 1, 2017). Don't miss the chance to become an EUSFLAT student member and apply for these grants. If you wish to apply for a EUSFLAT grant, email your application to grants@eusflat.org (with sfla2017.summerschool@usc.es in CC and SFLA 2017 as subject). Please, attach a motivation letter justifying your request, a reference letter from your advisor, and a Curriculum Vitae. For grant holders, it is mandatory to take part in the YTD Contest (see further details).